Kevin Harrington, the original “shark” on ABC-TV’s “Shark Tank,” told the IBEX audience today that digital marketing is key to reaching millennial consumers. 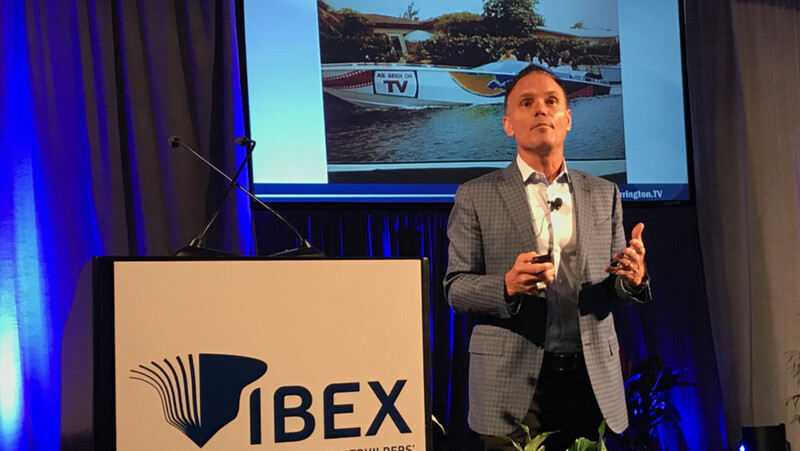 TAMPA, Fla. — Kevin Harrington’s keynote address Tuesday morning at the International BoatBuilders’ Exhibition & Conference noted 10 “must-do” trends companies need to pursue to advance their digital marketing platforms. Digital marketing is now absolutely essential to the survival of a company, Harrington said. And just as important, companies need to look closely at disruption within industries to stay current and profitable. Harrington, who addressed 750 recreational marine professionals at the industry breakfast, is a celebrity entrepreneur known worldwide from his years as the original “shark” on ABC-TV’s “Shark Tank” and for his success in the creation of the infomercial. Harrington is responsible for getting the Ginsu knife (“it slices, it dices”) onto television in the 1980s and turning the infomercial into a billion-dollar business. Harrington said digital marketing is key to reaching the millennial consumer. “I shifted my business to where 60 percent of [it] is digital,” he said. The millennial consumer was his top concern. “In order to sell more boats, you need a younger audience,” he said. The way to reach them is through digital marketing. Video is key, he said, and he emphasized video in his outline of 10 trends. Businesses need to be aware of market disruptions, too, Harrington said. Uber has changed the taxi industry; Airbnb has changed the hotel industry; Amazon has changed the retail industry. “In my industry, Google Fiber is going to be so much faster that it will disrupt the TV industry. It is 10 times faster than the internet. Everywhere I turn, there is disruption,” Harrington said. Harrington suggested that members celebrate improvements in the boating industry, but diligently analyze their digital platforms and dedicate time and resources to digital advertising. “Each company should have not only a CEO and a CFO, but now there needs to be an investment in a chief digital officer inside each company,” he said.